Our blueberry coffee cake with a toasted almond streusel topping is absolutely delightful. It is a very easy cake recipe and can be made with either fresh or frozen blueberries. That makes it an easy year round treat. Cream the softened butter, gradually add the sugar, beating them together until the mixture is light and fluffy. 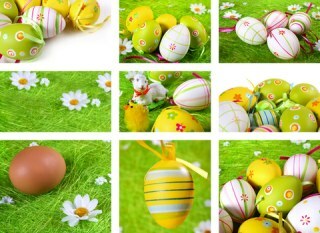 Add the eggs, one at a time, beating well after each egg is added. Stir in the 2 teaspoons of lemon juice. Combine the flour and baking powder and stir into the creamed mixture, mixing well. Spread the batter evenly into a greased and floured 13"x9"x2" glass baking dish. Sprinkle with the blueberries and remaining lemon juice. Combine the flour, sugar and almonds for the topping. Cut in the butter until the mixture resembles coarse meal. Sprinkle the topping over the berries. Bake at 325°F for 40-45 minutes. 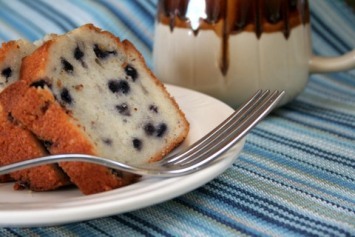 This blueberry coffee cake tastes great served with delicious homemade ice cream. You can also mix the blueberries into the cake batter instead of laying them on top. Left on top the blueberries will sink into the cake a bit, but if you want to mix them in, add them gently to the batter before putting the batter into the baking dishes. What does creaming the butter mean and why do we do it? Cream the butter by “scrunching” it with a fork, over and over again, until it becomes lighter yellow in color. That adds air to the butter and helps to ensure your cake is nice and light in texture. This delicious coffee cake can easily be changed to suit your taste. Replace the blueberries with fresh raspberries for a refreshing change. Or try using sweetened dried cranberries. You can also substitute chopped or slivered almonds for a lovely almond coffee cake, great with the almond topping. Okay, cake isn’t the healthiest thing we can eat, but we all need a treat sometimes. You can make this cake healthier in a couple of ways. 1. Omit the almond topping and add chopped toasted almonds to the cake itself. I would add about 2/3 cup of toasted almonds or chopped blanched almonds to the batter just before you make it. Almonds are amazingly healthy for us. Check out why here. 2. Add even more blueberries to the batter. I would add 3 cups if you want more blueberry flavor. Don’t add so many blueberries that there are more berries than cake. Test it by inserting a cake tester or toothpick into the center. It is fully baked when the tester comes out clean. Easy streusel coffee cake recipes like this one are always welcome. This is a great recipe to make ahead and keep in the freezing in case you have last minute or unexpected guests. Friends and family will all love the mix of flavors in this lovely homey coffee cake. It is a wonderful basic coffee cake recipe that you can change up quite easily. See our tips below for some great suggestions. This blueberry coffee cake is just one of our fantastic blueberry recipes. Find them all here.